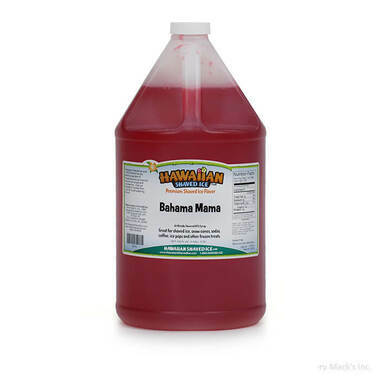 Go ahead and start packing, because one taste of Bahama Mama snow cone flavoring will have you ready hop on the next plane to an island getaway. This delicious summer treat is perfect for long days by the pool. Get the island vacation you've always dreamed of without leaving your backyard! Bahama Mama Hawaiian Shaved Ice is guaranteed to be the perfect refreshing treat on a hot day. A fruity pina colada mix, this snow cone is something that both kids and adults can enjoy. 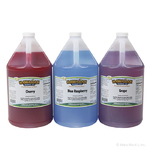 Whether you are entertaining a group or just trying to take a mental vacation, Bahama Mama sno cone flavored syrup is the shaved ice flavoring for you. Pour this delicious blend and pina colada flavoring all over your Hawaiian Shaved Ice � your vacation starts now! Buy this syrup in a gallon size for the ultimate getaway experience; we also sell this flavor in the quart size and in assorted packages.